Woodland kingfisher Halcyon senegalensis, photographed by Chris and Megan Perkins. The Alcedinidae are the kingfishers, a family of long-billed carnivorous birds found worldwide. Despite their common name, many members of the Daceloninae, the wood kingfishers, are not primarily fish-eaters, instead feeding on insects, worms or small terrestrial vertebrates. One of the largest kingfishers, the laughing kookaburra Dacelo novaeguineae of eastern Australia, is well-known as a predator of reptiles. The more dedicated piscivores are found among the other two subfamilies, particularly the water kingfishers of the Cerylinae. 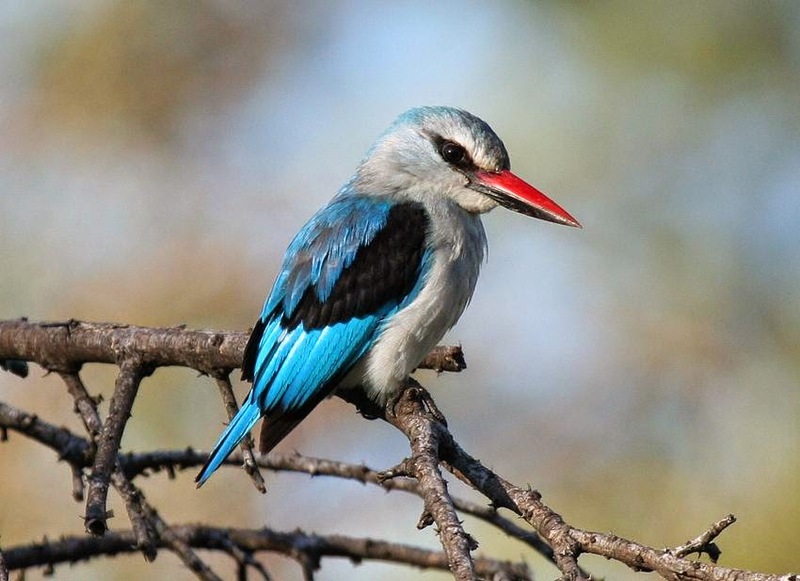 These are narrow-billed, often large kingfishers found in Eurasia, Africa and the Americas. Characters (from Austin 1961): Thick-set; head large; bill long, strong, usually pointed; neck and tail short; legs short; feet small, weak; front toes joined for more than one-third of length.